Superman/Doomsday: Hunter/Prey #2 © 1994 DC Comics. BACK COVER ART BY DAN JURGENS AND BRETT BREEDING. Abrawny fist, spiny protrusions shredding the fabric of its glove, hammered through a steel wall in a late 1992 prelude to a Superman storyline. The fist belonged to Doomsday, a 7-foot monstrosity of unknown origin, erupting from a prison pod with wanton destruction on his mind. In DC Comics' landmark “Death of Superman” serial, Doomsday barrels through North America, plowing over the Justice League and attracting the attention of the mighty Man of Steel. Superman and Doomsday's battle evolves over several issues, climaxing in a blood brawl in the highly publicized Superman vol. 2 #75 (1993), in which Superman sacrifices his life to stop this behemoth (although the hero was, after much story exploitation, later resurrected). Doomsday was created by committee. Writers, artists, and editors periodically gathered at “Supersummits” to chart the overlapping events of the franchise of four monthly Superman series, and Doomsday was the group's 1992 attempt to introduce “a foe that Superman could barely defeat,” remarked Superman #75 artist/writer Dan Jurgens. The publicity machine behind the “Death of Superman” event triggered international headlines and the brief fashion trend of black “S” armbands. Superman #75's release packed millions of new consumers into comics shops, many of whom speculatively purchased multiple copies as future collector's items. The Man of Steel's epic struggle with Doomsday was also chronicled in prose by comics scribe Roger Stern in the best-selling novel The Death and Life of Superman (1993). 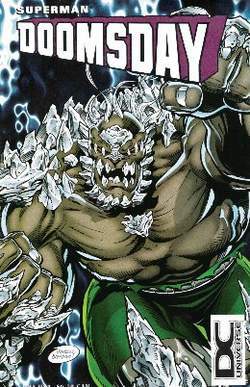 Eager to revisit this “box-office” bonanza, DC and Jurgens produced the three-issue miniseries Superman/Doomsday: Hunter/Prey (1994), revealing Doomsday's origin: eons ago he was genetically engineered on Superman's homeworld of Krypton to be a killing machine capable of regeneration if ever defeated. With the help of a Kryptonian battlesuit, Superman bested Doomsday, but this seemingly unstoppable force continues to occasionally resurface—including television appearances on the Cartoon Network's Justice League (2001–2004) and Justice League Unlimited (2004–present), with Michael Jai White of Spawn fame lending the monster voice. The two-company structure dates from the founding of Strack & Van Til some 26 years ago, when Frank's father, Nick Van Til, joined forces with another grocer, Ernie Strack. The Mega Mart and Strack & Van Til stores are similar in size and format. Gordon McVie, scientific director of Britain's Cancer Research Campaign, calls the proposals to engineer tumor cells instead of TIL cells "absolutely brilliant. But preliminary work with TIL therapy raised questions about why the method works for some patients and not for others. By adding a genetic marker to the TIL cells before reinfusing them, to the researchers hope to determine the cells' fate in the body and to see whether some types of TIL cells attack tumors more efficiently than others do. Researchers suspect that in unimproved patients, the TIL cells either are dying too quickly or may be losing some of their tumor-killing propesrties.